When Reindeer Research Program employee Darrell Blodgett took his morning walk Sunday, March 29 he stopped to check on the reindeer at the Fairbanks Experiment Farm and discovered the birth of the earliest calf ever to arrive at the farm. 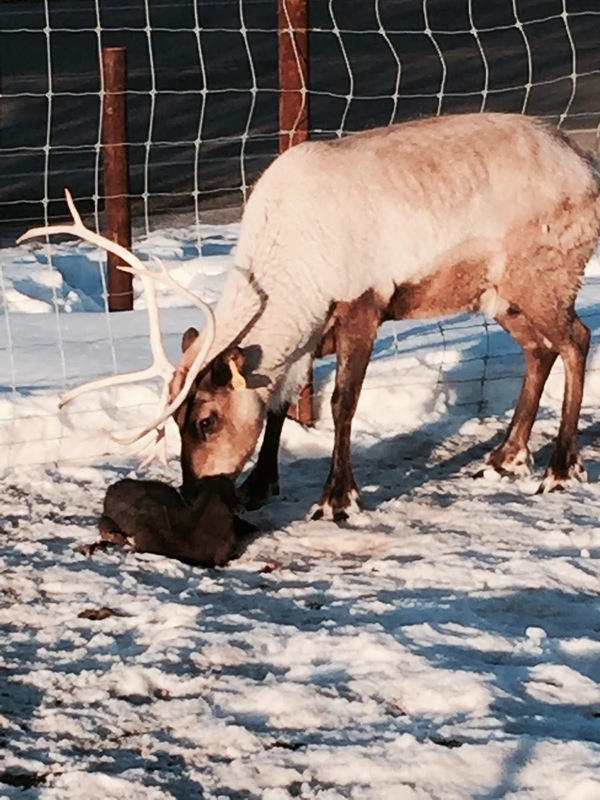 A first-time reindeer mother follows her frisky calf at the Fairbanks Experiment Farm Monday. He immediately texted animal caretaker Erin Carr to give her the news and said he would leave the afterbirth for her to clean up. "The calf looked good and dry and there were no ravens around so I went down below to check the other deer," Blodgett said. Carr arrived shortly after, amazed at the March birth. She weighed the calf at 13.42 pounds, a healthy weight. She said 41 cows went into harem in August and about 30 calves are expected this spring. School children who want to help name reindeer calves can do so here. Names are submitted and held till August when the RRP crew matches names to calves. In the meantime, the new calf frolicking about the pens at the farm has been dubbed 1501, for the year 2015 and being the first calf to arrive. Darrell Blodgett captured this image of the mother and calf Sunday morning.